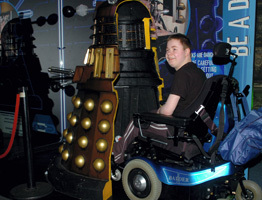 Michael, aged 15 who comes from Thurso in northern Scotland, had his wish granted when he, his parents and older sister Stacey visited the Doctor Who Up-Close Exhibition at the Museum of Science and Industry in Manchester at the end of June 2007. Michael who is living with Duchenne Muscular Dystrophy has been confined to a wheelchair for about 18 months. He loves everything and anything to do with Doctor Who. His wish involved travelling down to Manchester and enjoying a three-night all expenses paid trip to Manchester. On the day of the wish, the family was collected by limousine from their hotel and given a tour of Manchester before being taken to the Dr Who Up-Close Exhibition, the largest in the UK. There they were fast-tracked through the queues and Michael was given a special Dr Who goodie bag. 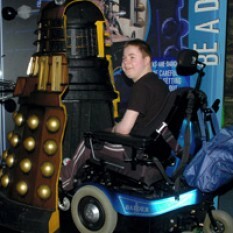 He was able to get up close to all the props, costumes and monsters from the Dr Who series; he even sat in his wheelchair inside a Dalek! His wish day ended with a family meal at the Hard Rock Café.